Crimeline, 1990-12-01. Mass Market Paperback. Used:Good. New York: Bantam. Very Fine. 1991. First Edition. Paperback Original A very fine unread copy in wrappers. .
Crum Creek Press. Used - Very Good. Great condition for a used book! Minimal wear. Crum Creek Press. PAPERBACK. 1932325379 Special order direct from the distributor . New. New York: Bantam Books, 1991. First Bantam printing, January, 1991. Edgar Award finalist. Spine slightly creased, very light wear, in protective sleeve. Inscribed by the author, dated May 24, 1991, on the title page. Note from Carlson on her stationary, referencing the Virginia setting, laid in. Size: 12mo - over 6¾" - 7¾" tall. Inscribed By the Author. First Edition.. Mass Market Paperback. Very Good +/No Jacket. Crum Creek Press. PAPERBACK. 1932325379 BRAND NEW, GIFT QUALITY! NOT OVERSTOCKS OR MARKED UP REMAINDERS! DIRECT FROM THE PUBLISHER!|0.6 . New. New York: Bantam Books, 1991. Gently rubbed, spine creased. Bookstore stamp on front free end paper. Signed by Carlson on the title page. Size: 12mo - over 6¾" - 7¾" tall. Signed by Author. 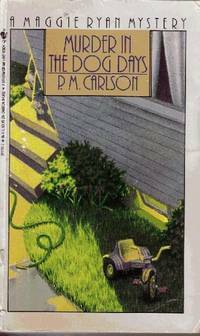 First Edition.. Mass Market Paperback. Very Good/No Jacket. Crimeline, 1990-12-01. Mass Market Paperback. Very Good. New York: Bantam Books, 1991 1st ed. thus. SIGNED title p. by author. 226pp. paperback: Very Good+ [text is age browned; else VG+] A Maggie Ryan mystery. Edition: 1991 1st ed. thus. New York, NY, U.S.A.: Bantam Books, 1991. First Paperback Printing. Mass Market Paperback. Good. Brief summary of content available upon request by e-mail. Crimeline. Collectible - Good. Signed Copy Collectible - Good. Signed/Inscribed by author on title page. Bantam, 1991. Softcover. NF.. Maggie Ryan mystery. U.S.A.: Crimeline, 1990. Book. Very Good+. Mass Market Paperback. A Nice Reading Copy - Book Is In Very Good + Condition. Boards Have A Small Amount Of Shelf Wear. Fore Edges Have A Small Amount Of Reading Wear. Interior Is Clean And Legible. No Store Stamps. Not Remaindered. Thanks And Enjoy..
Random House Publishing Group, 1990. Mass Market Paperback. Good. Disclaimer:A copy that has been read, but remains in clean condition. All pages are intact, and the cover is intact. The spine may show signs of wear. Pages can include limited notes and highlighting, and the copy can include previous owner inscriptions. At ThriftBooks, our motto is: Read More, Spend Less.Dust jacket quality is not guaranteed. Crimeline, 1990-12-01. First Edition. Paperback. Very Good. First printing (complete # line), VERY GOOD, no markings.Ships fast with tracking!
. : Crimeline, 1991. Please email us if you would like further information or if you would like us to send you a picture of the book. The book i am offering may not have the same cover as the one pictured. they are stock photos from the site. Thanks for looking!. First Edition 1st Printing. Mass Market Paperback. Very Good. 16mo - over 5¾" - 6¾" tall. Crimeline, 1991/01/01 00:00:00.000. Mass Market Paperback . Fair. Carlson,P.M. Murder In The Dog Days (Crime Line) All Orders Shipped With Tracking And Delivery Confirmation Numbers. Bantam Books. Good. 1991. Paperback. The spine and both covers, next to the spine, are creased from reading. The pages are clean, no tears or soiling. The pages and binding are tight. There is a crease on the back cover about 2" long. The spine is missing some of the glossy paper towards the back cover and is tore and peeling towards the bottom front. The text is not damaged. ; A Maggie Ryan Mystery; Vol. 6; 16mo 6" - 7" tall; 226+ pages; Map by Jackie Aher. For one Mosbyite, reporter Dale Colby, is about to publish a hot expose about prominent-and not-so-prominent-townsfolk...Bu t there lies Dale, in a pool of blood, deader than the story he'd intended to write. A list of villagers with motives is as long as the Mosby phone book. A great start to Maggie and Nick's escape the broiling New York summer vacation. The spine is peeling at the top. Will combine shipping on more than one book. .